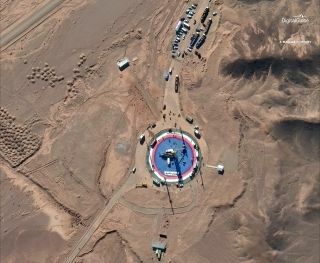 A photo from DigitalGlobe of Iran's Imam Khomeini Space Center shows, according to company representatives, people and launch vehicles at the launchpad on Feb. 5, 2019, as well as the two-stage Safir rocket, a truck with possible propellant tanks and a barrier to restrict access to the launch site. Industry experts have suggested the launch failed just after liftoff. If true, this would be the second Iranian launch failure in less than a month. Iranian officials announced that the Doosti satellite — whose name means "friendship" in Persian — was ready to be launched on Feb. 4, according to Iran Daily. And new images shared with Space.com by the satellite imaging company DigitalGlobe reveal activity at the Imam Khomeini Space Center launch site on Feb. 5 — including people and launch vehicles at the site, the two-stage Safir rocket and a truck with possible propellant tanks — with a scorched scar on the launchpad and runoff from a post-launch washdown visible on Feb. 6. However, officials have not announced a successful launch to an English-speaking audience. The Doosti satellite, which according to AP News is a remote-sensing satellite, was developed at Tehran's Sharif University of Technology. A DigitalGlobe image from Feb. 6, 2019, shows the seeming aftermath of a launch, with a blast mark on the launchpad and runoff from a post-launch washdown of the site. Michael Elleman, a senior fellow for missile defense at the International Institute for Strategic Studies, told NPR that satellite imagery suggests the small Safir rocket made it at least 10 seconds into the flight. David Schmerler, a senior research associate at the Middlebury Institute of International Studies, told NPR it likely went up and failed to insert the satellite into orbit. Writer and international affairs analyst Ankit Panda tweeted that a source had confirmed the effort "failed shortly after launch." The Iranian news site Hamshahri appears to confirm that the spacecraft launched. An overview of the Imam Khomeini Space Center in northern Iran. A previous Iranian launch failed on Jan. 15, according to a report from AP News. That imaging satellite, called Payam ("message"), failed during operation of the rocket's third stage. This was a newer, larger rocket than that used for the Doosti launch. The U.S. government has criticized Iran's space program for possibly helping the nation develop nuclear weapon capabilities, according to the AP. Iranian officials have classified both failed launches as non-military.